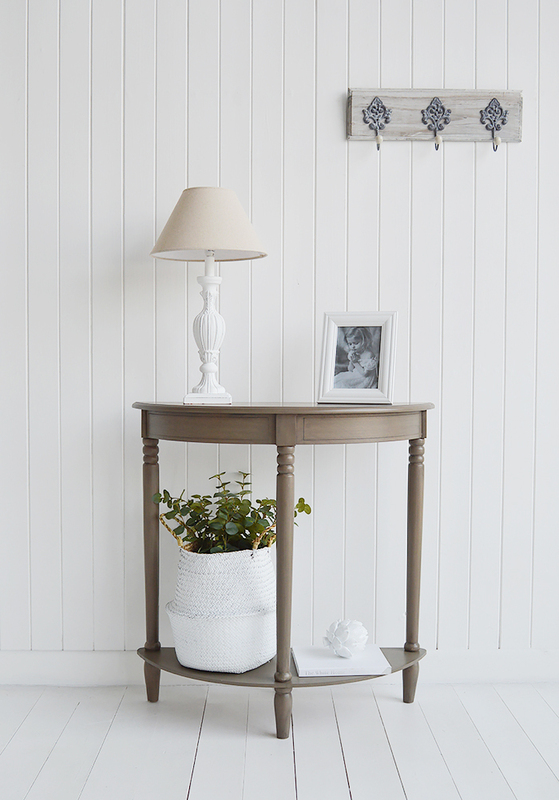 Console tables, most often found in as hall furniture pieces, provide style and functionality, they add storage and extra surface for lamps and flowers giving you a warm welcome as you enter your home. A main deciding reason for choosing a console table is the size of your hallway, you should select as large as is feasible. For small hallways you may be best considering a small console table such as a lamp table, but whatever your choice make sure the table offers some additional storage such as drawers for everyday bits and pieces including coins, pens, keys that create general disorder. Position a basket under the console for storage of shoes or bags. 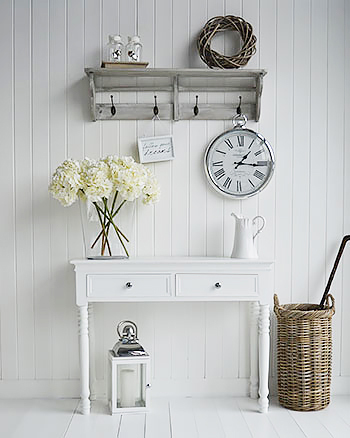 A white console table will reflect light and invade the whole space giving the impression of a larger area. 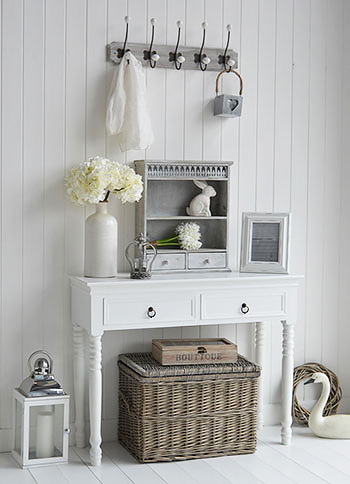 A console table will also provide display space for lamps, photos and your favourite home decor pieces. For greater organisation on your table we love our keys and coins boxes as well as our letter racks. 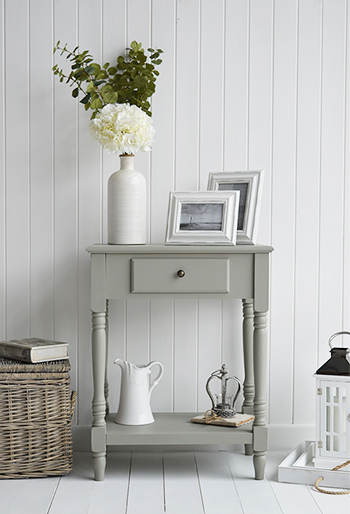 For some help on decorating your table see our article on how to... style your console hall table. 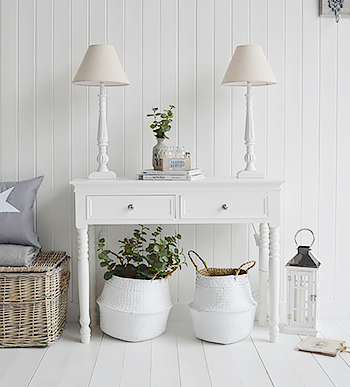 An all white hallway, an ideal style when designing a coastal interior. 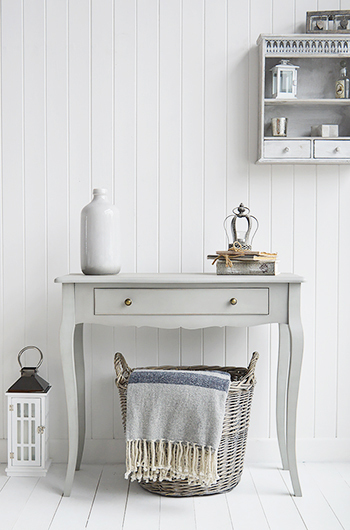 Clean, bright and fresh for a fabulous hall or living room. 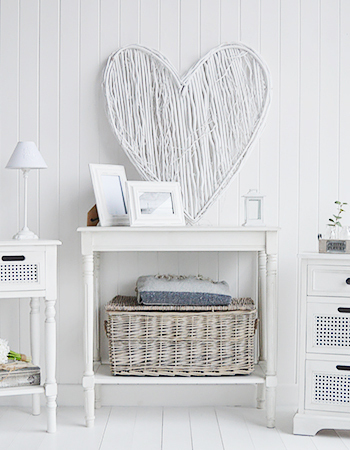 Adding an umbrella basket and a coat rack is all the furniture you need for hall furniture, the table is the centre piece white the rack is the functional side.